The new Key Durban Service Centre. The new workshop has been built around Isuzu Motors South Africa’s global standards and systems. The Key Group has opened an impressive new Isuzu truck service and parts centre in Durban South which will support Key Durban Truck Service Centre, the servicing and supply of parts for Isuzu trucks, as well as Key Vehicle Management (KVM) which includes Key Hire, and Key Smart Buy (hire vehicle disposal outlet). Isuzu Motors South Africa’s consolidation of its truck and light commercial business earlier last year accelerated the Key Group’s decision to establish a new service presence in the Durban market. 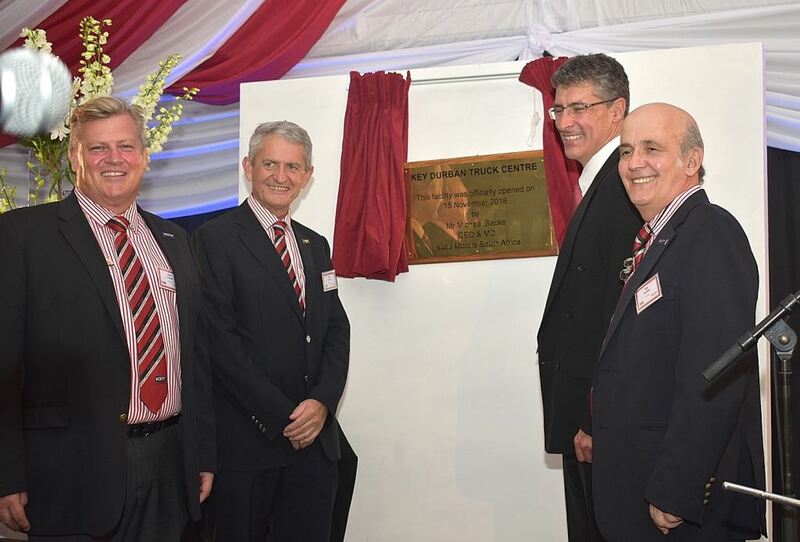 This new Isuzu commercial centre is just off both the M4 and N2 highways, adjacent to the massive Clairwood Logistics Park which, at 358 000 sq.m, is Fortress REIT Ltd’s biggest national investment in industrial logistics property. The Durban-Pinetown industrial region, stretching to the boundaries of eThekwini municipality, represents the second largest truck market after Gauteng in Southern Africa. Added to this, there are over 50 000 Isuzu trucks on South Africa’s roads nationwide – with many travelling in and out of KwaZulu-Natal (KZN) where Durban is the end of the logistical corridor. From an aftermarket perspective, the real market interest lies in the one to ten-year market of which there are just over 5 000 Isuzu trucks to be serviced in KZN. A fully stocked Isuzu truck parts department. A-grade space for KVM and Key Hire – now one of the largest KZN Isuzu fleet owners with 400 units under contract management and hire. This facility will cater for the service and repairs not only of the Isuzu franchise brands but all brands under the KVM umbrella. This offers any fleet owner that operates multiple vehicle brands in their fleet a one-stop service provider. With a high accent being placed on environmental responsibility nowadays, the new site has the latest equipment installed from an environmental aspect. This ranges from a covered ultra-modern wash-bay, grease traps and water storage with recycling to highly energy-efficient LED lights fitted at the facility. Full workshop cleaning equipment has been installed and will be utilised daily to keep not only the workshop but the entire facility clean. A driver rest room has also been catered for, including a shower, rest facilities and a comfortable waiting area with refreshments. 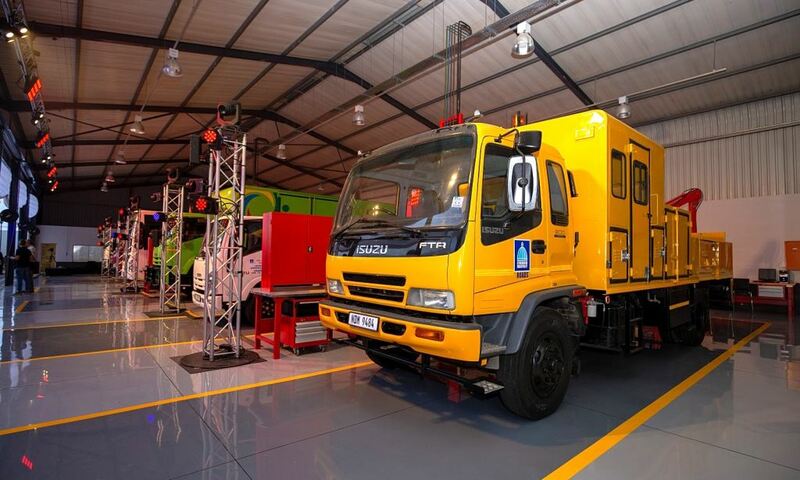 “This new workshop has been built around Isuzu Motors South Africa’s global standards and systems but more importantly, local requirements have also been accounted for. It’s not only the building and property, but our investment includes special tools, lubrication systems, storage and software systems exceeding R2-million. We are keenly aware of reducing vehicle downtime and parts supply is a focus area,” says Emanuel.